In recent weeks, some have encouraged Alaskans not to sign a statewide petition to that would allow Alaska voters to decide whether or not to update Alaska's salmon habitat laws. An op-ed here (Commentary, Oct. 19) expressed concern about how passing the "Stand for Salmon" initiative could affect our ability to manage and develop Alaska's resources. As we consider how to meet the needs of both development and conservation, I'd like to share what science and history suggest about what the initiative could mean for us as a state. Alaska's fish habitat laws have remained largely unchanged since they were passed shortly after statehood in 1959, and are in need of modernization to reflect the knowledge we've gained in the years since. An update will help ensure that salmon remain a thread that unites us across generations and cultures, and see that our laws better reflect the values that Alaskans have long held. • Define a healthy water body. This update clarifies the important habitat characteristics needed to maintain and support salmon runs. These include things like water quality, flow levels and fish passage. • Promote responsible development. This update outlines clear scientific standards by which proposed development near salmon streams may be evaluated so that our agencies can make better-informed decisions on permits and their impacts to wild salmon. • Protect salmon rivers. Currently, less than 50 percent of Alaska's salmon-bearing waters are cataloged for protection. The third update recognizes any waterway that produces salmon so we're not leaving important areas unidentified. • Give Alaskans a voice. The fourth update would require the Alaska Department of Fish and Game to notify the public and give Alaskans an opportunity to participate in important decisions that could impact or harm our wild salmon. The Stand for Salmon initiative provides a plan to maintain our natural capital — in the form of our rivers, lakes and streams — and see that it continues to pay out annual dividends in the form of salmon returning home to our rivers. Anyone who has ever received a Permanent Fund dividend check has benefited from the same idea of harvesting yield from well-managed capital. In this case, the capital that yields salmon dividends is our salmon habitat. Naysayers suggest that the Stand for Salmon initiative is a disproportionate response to a problem that does not exist, but that narrative is dispelled by a mere glance at history. Wild salmon and the cultures and economies they sustained were once found throughout both sides of the North Atlantic not unlike what we have in Alaska, but today few people from even the Lower 48 know that wild salmon once thrived in their backyards. One recent study in the journal Scientific Reports (Lenders et al. 2016) estimates that 90 percent of the wild salmon population that once thrived throughout Europe was gone by the year 1600 AD, mostly due to the growing number of small watermills and their effects on river ecology. While people today look to Alaska as an example where wild salmon are still abundant, our existing laws unintentionally allow for the same kind of same death-by-a-thousand-cuts. The Stand for Salmon initiative aims to correct this oversight and chart a better course for our future than what has played out around the world. In my work as a scientist studying juvenile salmon habitat, I am constantly surprised by the unpredictable places where salmon live. From the smallest trickle to the murkiest swamp to roaring silt-laden glacial rapids, both adult and juvenile salmon are found throughout all parts of a watershed — far beyond where our eyes might guess. The diversity of this "portfolio" of many types of habitats is an essential insurance for salmon as landscape and climate conditions change gradually over time. 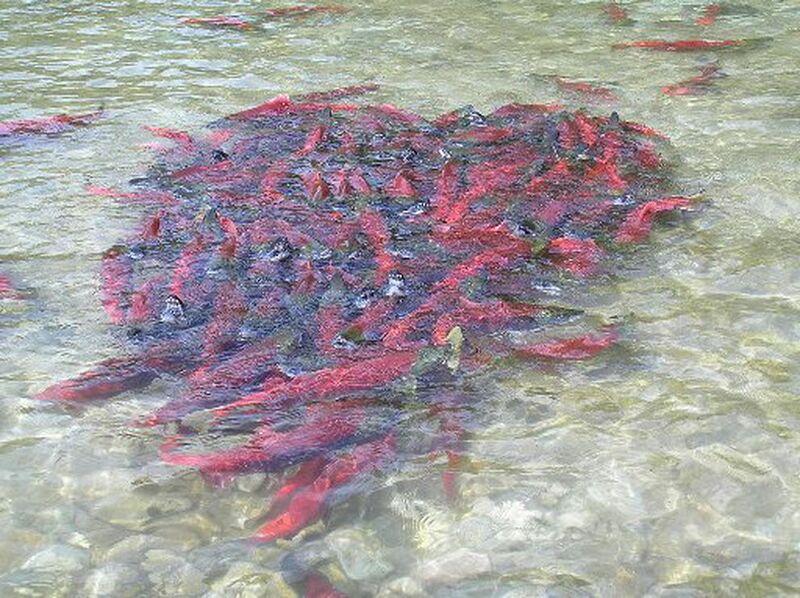 As glaciers advance and retreat, as streams flood or dry up, as temperatures rise and fall, salmon have a better chance at adapting to these long-term shifts when we leave them with as many habitat options as possible. Development and conservation are not incompatible. I want to see Alaska's resources managed wisely for long-term yield. The Stand for Salmon initiative aims to ensure that developing one resource does not devalue another, and codifies our intentions as a society that wants to pass on it's most valuable resources for future generations. I'll be signing the ballot initiative so that Alaskans at least have a chance to decide one way or another. I hope that when I die I leave a legacy of intact habitat and strong salmon runs in the state of Alaska. Benjamin Meyer grew up in Wasilla and is a masters student in fisheries at University of Alaska Fairbanks. He has worked throughout the state as a biologist in both the public and private sector. He is currently working on research to evaluate potential impacts of climate change on juvenile chinook and coho salmon habitat in the Kenai River watershed. The perspectives shared here are not on behalf of the University of Alaska or any other organization.